Winter can be a magical time, but it can also be a nightmare if you’re the parent of a toddler! As their immune systems aren’t as strong as an adult’s, toddlers are a lot more prone to pick up airborne infections. This means if there’s a cold or flu virus going around, you can guarantee your little one is going to pick it up and spread it to the rest of the family. Now, it’s practically impossible to stop your toddler getting sick at least once during the winter. Even if you manage to stop them getting within 4-6 feet of somebody who is sneezing, coughing or sniffling, the actual infection often starts before symptoms show. So, at any time your toddler could be exposed to an infection without you even realizing it. However, this isn’t to say you can’t take precautionary measures and limit the amount your toddler is sick this winter. Below, you’ll discover 10 ways to keep your little one as healthy as possible as the colder, germ-prone months set in. 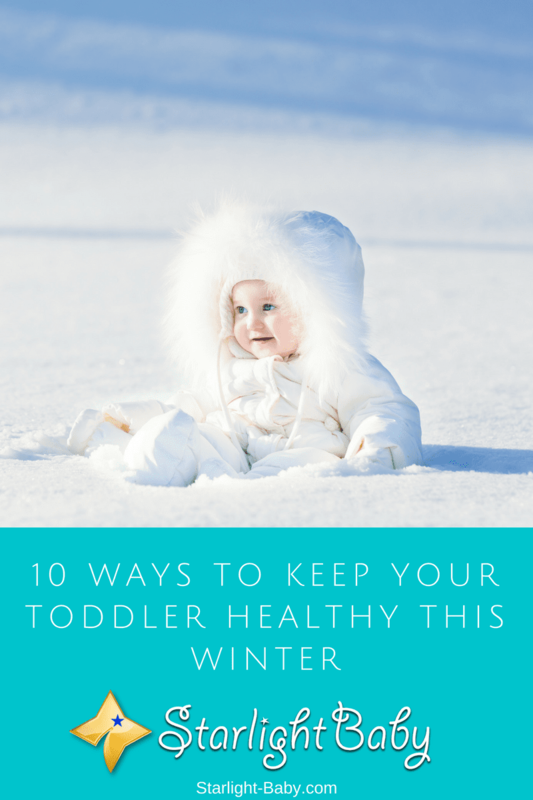 This is by far the simplest, yet most important tip to help your toddler stay healthy this winter. Washing their hands regularly is important due to how much toddler’s use their hands. You’ll often witness them sticking their hands in their mouths, and if they’ve been in contact with cold and flu germs, they’re guaranteed to get sick. So, encourage hand washing before meals and snacks, after going to the toilet and after playtime and daycare. Warm soapy water tends to work best. The FDA is actually trying to reduce the amount of antibacterial based ingredients within hand wash, claiming it can do more harm than good. Don’t forget about your own hygiene too. You’ll need to wash your own hands each time you change a diaper or wipe your toddler’s runny nose. You’ll also want to wash prior to preparing food and after going to the toilet. The same rules should apply to all of your toddler’s caregivers, too. Of course, not all parents are a fan of vaccinations. If you’re not keen to have your toddler vaccinated, then there are other preventative measures you can take. You’ll need to speak to a doctor to see what they recommend. If you’re not opposed to vaccinations, they can really help to protect your little one against certain types of bacteria and viruses. Again, it’s best to talk to your doctor as they’ll be able to tell you everything you need to know to help you make the right decision for you and your child. It’s easy to ensure your toddler is healthy at home, but what about when you pack them off to daycare? You’ll want to have a look at your toddler’s daycare sick child policy to ensure it’s adequate. How does the daycare ensure sick children are kept away from healthy ones for example? Usually, day care centers ask parents to keep children home if they have a cold, flu, fever or diarrhea. However, if you regularly see sick children at the center, it’s worth chatting to the caregivers to try and get the sickness policy altered. If they refuse, it could be time to look for a new daycare center. This is definitely one of the hardest tips on the list. It can be pretty tough to stop your toddler touching anything and everything; especially their own face! However, if your little one does have germs on their hands, if they touch their nose and eyes, those germs will inevitably end up within their mucous membranes. From there, the germs will quickly enter the bloodstream. If you can teach them not to touch their nose and eyes, you’ll significantly reduce the chances of them getting sick. One way to do it is to teach them to use a tissue, rather than their hands. This can also extend to teaching them to use a tissue when they sneeze or cough. It’s going to take a lot of perseverance to teach your toddler not to touch their nose and eyes with their hands. However, eventually they will start to remember, and it will help to reduce the risk of not only them getting sick, but from passing it on if they do have a cold. There’s a lot of benefits that come from breastfeeding throughout the toddler years. While you’ll also want to provide a healthy solid food diet, a little breastmilk can work wonders to fight off infections. Just like when they were a baby, your toddler’s immune system can be really strengthened through breastmilk. It still contains all of the nutrients and protection it did when they were an infant. So, continue breastfeeding or at least expressing milk and feeding with a bottle. The above have largely focused on preventing a cold. However, as mentioned earlier, it’s often impossible to stop a toddler getting sick at all during the winter. The good news is, there are things you can do to clear up a bug quickly, and saline nose drops is just one thing you can try. Your toddler isn’t likely to enjoy this process, but it can be very effective. It’s best to apply the saline drops via a bulb syringe. Simply tilt your toddler’s head back a little, then squeeze a few drops of the saline into the nose. You can use the syringe to then remove any mucus. Of course, your toddler may not let you do this and it’s important not to force them to have it done. However, if they don’t kick up too much of a fuss, saline nose drops can work wonders for relieving congestion and clearing mucus from the airway. Along with breastfeeding, making sure your toddler eats a nutritious diet will also help to reduce the risk of viruses. You’ll want to focus on foods which contain a lot of selenium, zinc and Vitamins C and E. These are especially great at promoting a healthy, well-functioning immune system. The best way to ensure they’re getting these all-important vitamins and minerals is to provide lots of fresh fruit and vegetables. You likely know yourself what too little sleep can do to your immune system. The same applies for toddlers. If their sleeping pattern is all over the place, you’ll want to start taking steps to get them into a good routine. If they don’t get plenty of sleep, they’re going to easily get run down and be a lot more prone to illness. If your toddler does get a cold, they’re going to find it worse during the night and while taking naps. A humidifier can really help to ensure your toddler can breathe properly and get off to sleep easier. The air provided by the humidifier is moist and that helps to really thin the mucus. This, in turn, relieves congestion and helps your little one get off to sleep. All of the tips featured above will help to minimize the risk of your toddler getting sick this winter, as well as help to clear up any viruses they may develop. However, it’s still important to seek advice from a doctor. While most viruses will clear up on their own, it’s still better to be safe than sorry. You’ll especially want to call the doctor if your toddler has a high fever, is suffering from pain in the face or ears, is wheezing or is suffering from diarrhea and vomiting. The above tips are useful to follow, but remember nothing can 100% prevent a toddler from getting sick. Winter does sadly expose us to a lot more germs and as most people already have a virus before they show any symptoms, keeping your toddler away from someone who is sick isn’t a guarantee they won’t get ill. This is all good advice. My family recently moved to Northern California from South Florida. I’ve lived in Florida since I was a small child, so this is my first time in my adult life living someplace with actual seasons, let alone winter. Since for all intents and purposes I’m a newbie to winter weather, I could really use a guide like this. Thanks! I hope the change in weather will not be too hard on you, ecole11j. Sometimes our body finds it difficult to adopt from a warm weather to cold weather. Hopefully, these tips will help you adjust. I must admit it’s a big adjustment. It’s even harder on my SO than it is on me. It’s the first time in his life that he hasn’t lived in a tropical climate. He’s never even seen snow before now! Thank you very much for your well wishes! Humidifier is such a big help. Having one at home is a must aside from other things it could help you but most specially during winter to keep you moist. Vaccinations are life saving and prevention for possible sickness. Winter is fun but the same thing with summer, autumn, fall, the weather changes and this is the easiest time we often get sick. It’s very timely article and reliable information. So true. People tend to be sick when it gets really cold. Flu vaccines could hopefully help prevent sickness because sickness is not a welcome thing especially with the coming holiday season. That’s good to know, thanks. I’ll look into buying a humidifier. And I work around children, so flu vaccines every year are a MUST. Great article. It’s such a big help. Maybe I’ll share this to my relatives. Most of my nieces are toddlers. Sharing this article with your relatives is a very good idea, nnacrter. Please do. We would truly appreciate it because we want to reach as many people as possible so we could help them. We would like to keep kids away from any illness because it’s so heartbreaking to see them suffer. Wow! It’s quite interesting to learn waya to protect our little ones during the period of winter. Vaccinations can help to boost their immune system much better so that they can’t contract flu during the winter period. It’s a season of mortality deaths and one nursing mothers should be quite careful about. winter is here and winter is a terrible time for babies and toddlers. My baby is just six months old. he is too young to make us play by his rules this winter, however, the next season when winter comes, he will definately make us worried. I appreciate these tips. The cold weather can really be terrible to our children’s health, so yes, a flu vaccine is in order. It will definitely save you from worries. Here in the Philippines when the rainy season comes (We don’t have winter here) but still it is cold, so the filipino moms put baby oil on the babies back to prevent the cold enter the babies body. The baby oil blocks the pores and it has a hot sensation at the back. We do this to prevent and colds for babies. We also do this when the baby are going to take a bath. When I was a child my mother do this to me also. I’m totally in support of vaccination during this period, cold should be taken lightly especially when babies and toddlers are involved. Their body immune system isn’t that strong to withstand harsh winter, but with vaccination, they would have an edge over it. Also it’s important to always cover up with thick cloths and avoid unnecessary exposure to cold because the tenderness of their body can’t carry the cold.